Resources are very limited in supply. All resources are to be managed by human. However, human have unlimited wants. Therefore, there are limited resources and unlimited wants and desire. Complete satisfaction is very necessary for better functioning of every aspect of the society. Therefore, for complete satisfaction in life resources are to be managed properly in such a way that human achieve complete utility and benefit simultaneously. Thus, to manage all resources available in such a way that it gives complete satisfaction to human beings is the theoretical meaning of management. To go on a deeper level, management can be defined as art and skill of getting things done through others is called management. More elaboration is given by George R Terry. According to Terry-“management is the distinct process consisting of planning, organizing, activating, and controlling activities performed to determine and accomplishes the objectives by the use of people and resources.” If we give our attention towards the definition we find that terry perceives the management as a process a systematic way of doing things. The four management activities are included under the process and they are planning, organizing, activating and controlling. According to this concept, Management is the art o getting things done through and with people in organized groups. It is the art of creating an environment in which people can perform and individuals could cooperate towards attaining of group goals. It is an art of removing blanks to such performance a way of optimizing efficiency in reaching goals. According to this concept, management is the art and science of preparing, organizing, directing human efforts applied to control the forces and utilize the materials of nature for the benefits to man. According to this concept, management may be defined as the art of securing maximum prosperity with a minimum effort so as to secure maximum prosperity and happiness for both employer n employee and provide best services thereby. According to this concept, management is the coordination of human and material resources towards the achievement of organizational objectives as well as the organization of the productive functions essential for achieving stated or accepted economic goal. These above definition of management, given by different writers and authorities, are found giving different senses. Virtually, the five concepts are found developed by the authorities emphasizing in different aspects. However, it has been realized by many that it will not be fair to define management based upon any one aspect. Management can be taken as process-managerial process or social process either engage in planning, organizing, staffing, directing and controlling or mobilizing the group activities to achieve the corporate goals. The word management itself refers as a noun. There are many kinds of employees in an organization . some people are involved in managerial function and some are involved in operating functions. The individuals who manage the organization and departments are managers. As a noun, the term management is used as single name of managers, board of directors, managing directors, departmental managers etc are included in management. 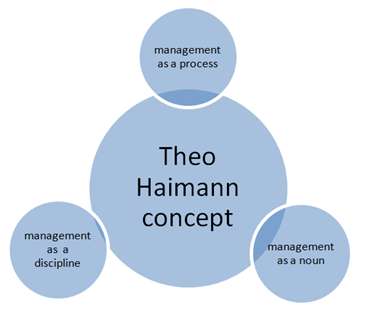 Thus, theo haiman the leading management expert expiained the meaning and concept of management.